13 November 2015, at 12:00a.m. GLOBAL - US pork exports for the first nine months of 2015 declined by less than 1 per cent year on year to 1.1 million tonnes. 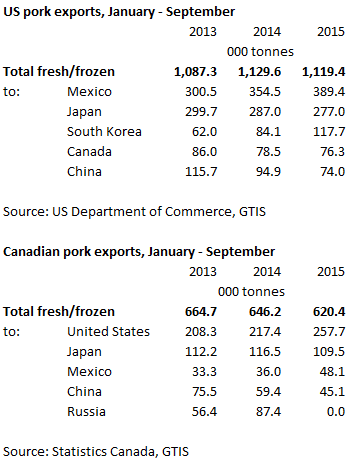 Canadian pork exports recorded a larger fall of 4 per cent year on year in the first nine months of 2015, to 620,000 tonnes. The decrease in US exports, of 42,000 tonnes, comes as a surprise given its pork production is running 8 per cent higher after the continued recovery from PEDv, leading to the expectation that exports would rise. However, the strong US dollar has hindered growth. Higher volumes of pork exported in the second and third quarter of 2015 offset the much lower figures recorded at the beginning of the year, resulting in the overall small decline. Mexico retained its position as the largest market for US pork, with exports to the country rising by 10 per cent. The Asian market became unbalanced for the US, with shipments to both Japan and China during the months of January to September down on the previous year, by 4 per cent and 22 per cent respectively. In contrast, trade to South Korea significantly increased, ahead by 40 per cent. Unit prices of pork have trended below last year’s levels throughout 2015, leaving the total value of pork exports at just over $3billion, down by 18 per cent. Canadian exports have declined throughout the year, with the lowest volumes being seen in the third quarter. The US remained the dominant destination for Canadian pork, taking nearly 19 per cent more than the same time period in 2015, whilst Mexico also recorded an increase of 34 per cent. Volumes destined for Japan and China declined by 6 per cent and 24 per cent in turn, whilst trade with Russia ceased altogether as sanctions remain in place. In line with the US, the total value of Canadian exports for the first three quarters of 2015 fell by 15 per cent to just under C$2 billion.